Service Provider of Vertical Gardening Service. Our product range also comprises of Railing Planter, FRP Planters and Stainless Steel Planters. 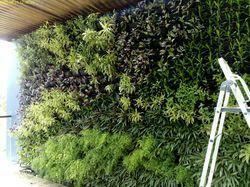 We are engaged in offering Vertical Gardening Service to our clients. Vertical gardening is generally offered to the place where horizontal space is less, so we make use of the vertical space and give it a nice look that attracts the viewers. The services we offer is reliable as we do not compromise with the quality of the product which is why we are known as reliable firm. Our experts make sure that seeds are grown in a conducive environment, which offers higher yield.